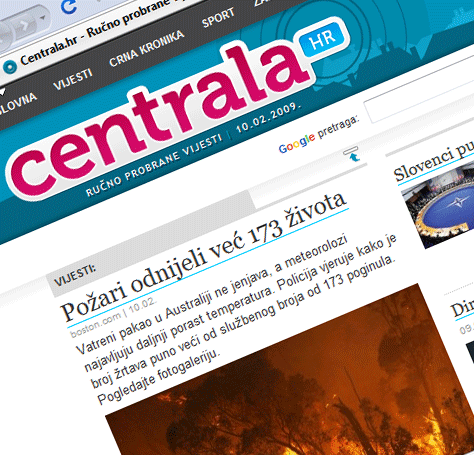 We just released your new homepage – Centrala.hr (eng. plānt – A building or group of buildings for the manufacture of a product; a factory.). :) Centrala is a human powered news aggregation site, where editors hand-pick best information from across the region just for you. In the avalanche of completely automatized rss aggregation news sites in Croatian cyberspace, we think a human touch can make a significant difference. What do you think? not bad :-) me like hand picked! TV programi su stavljeni u proceduru! :) Thanks for the feedback mate!